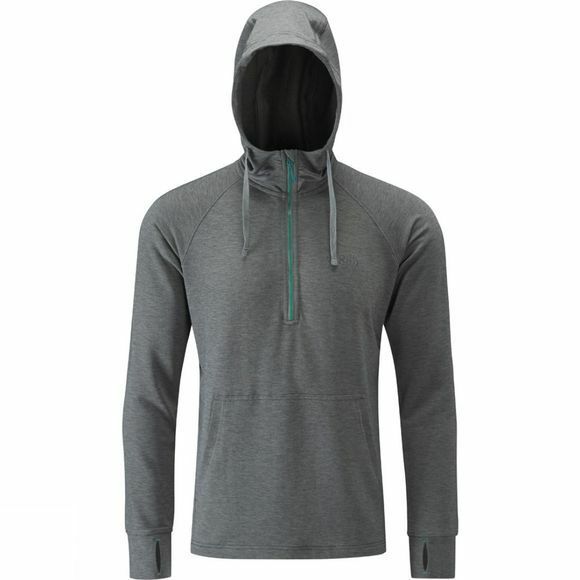 The mid-weight Top-Out Hoody from Rab is perfect for summer layering, whether that's indoors or at the crag. The Drirelease stretch fabric provides an excellent range of movement, while remaining quick drying with wicking properties. Odour control is also used to ensure that you stay fresh after time on the face. A deep venting YKK chest zip and underarm gussets will help to keep you cool while working hard, with a chin guard added for comfort. Storage is provided by the front kangaroo pocket. Deep cuffs with thumb loops and an open hem provide a cosy regular fit, with an adjustable hood for further warmth and protection if needed.